We make high quality miniature sculptures depicting historic sites in the South Western U.S. these we sell as magnets and ornaments. We do the Alamo and the 4 Missions of San Antonio (San Jose, San Juan, Espada and Concepcion) as well as San Fernando Cathedral, The Little Church of La Villita, and the Spanish Governor's Palace along with the other 5 missions in Texas, 3 in El Paso(Ysletta, Socorro, and the Chapel San Elizario) 2 in Goliad (Espiritu Santo, and the Presidio La Bahia) and the L.B.J. Texas White House. Outside of Texas we do Cliff Dwellings from Mesa Verde, Canyon de Chelly and The Gila Forest. We make depictions of ruined pueblos at Chaco Canyon, both Pueble Bonito and Pueblo Arroyo, the Great Pueblo at Aztec Ruins as well as the 3 Salinas Valley Pueblos (Grand Quivera, Abbo, and Quarai.) I have also done other buildings including Mission San Miguel in Santa Fe and a scene from Carlesbad Caverns. We also do the center circle of the Aztec Calendar, some texas theme designs and Celtic knots. We, Bill and Maggie, would like to welcome you to our home page We have made our living as potters in a small town, Mico, in the Texas Hill Country, just west of San Antonio since 1980. 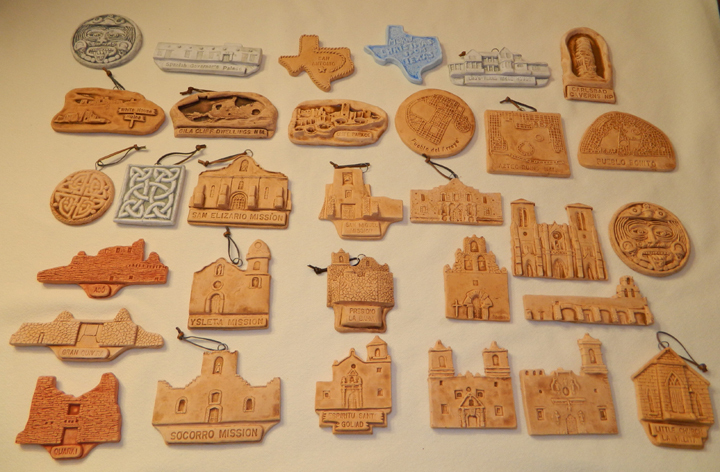 We now make sculptures of historic buildings of the Southwest and make them into magnets and ornaments. Where is Mico? What is Mico Like? Pictures of Maggie and I, a watercolor picture of Bill painted by Lorenzo Castaneda, a good friend of ours, and caricatures of us over the years as seen by another friend of ours, Harry Schneider. This page has some news paper clipping of articles that have been written about us over the years. 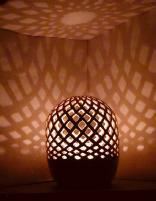 When we were making pottery and selling it at Art Shows we spent a lot of weekends at the Mexican Market in San Antonio and over the years I have taken many pictures there so I thought I would share a few with you. How do you make your replicas? What is the material they are made from? See our Price and Order Page for phone and address information. We are in a state of transition and who knows where we will go. I will be adding other historical replicas as I sculpt them I would like to add a section on how you can work with clay, and hints for potters, and much more so please Bookmark this page and return to it from time to time to see what is new.